This two-volume milestone work, published in 1776, was the first major publication of William Withering (1741-99), a physician who had also trained as an apothecary (his Account of the Foxglove, and Some of its Medical Uses is also reissued in this series). The first systematic botanical guide to British native plants, the present work uses and extends the Linnaean system of classification, but renders the genera and species 'familiar to those who are unacquainted with the Learned Languages'. 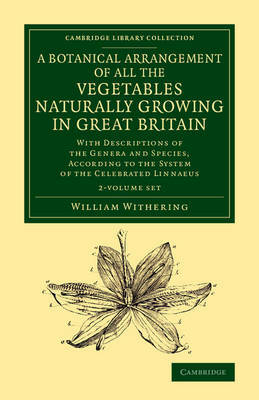 Withering offers 'an easy introduction to the study of botany', explaining the markers by which the plants are classified in a particular genus, and giving advice on preserving specimens, but the bulk of the work consists of botanical descriptions (in English) of the appearance, qualities, varieties, common English names, and uses of hundreds of plants. The book continued to be revised and reissued for almost a century after Withering's death.